My father’s agitation the night before he died was explained to us only later by the hospice nurse who gently washed his body, disposed of the morphine left beside the bed, and filled out the death certificate. She said that in those last few hours, especially when someone has been sick for a long time, it is as if they are desperately looking for an exit off of a highway, becoming more and more distressed along the way until they find it. That made sense. My father had said he was ready to die after living with lung cancer for almost four years. I believe he was able to express that acceptance for a couple of reasons. 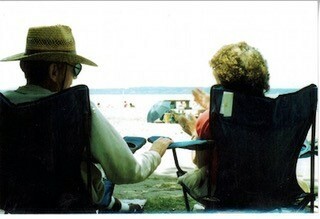 One was that he had made sure that everything was in place for my mother to live comfortably after he was gone. He had meticulously documented their financial matters and important contacts, mostly hand-written on the yellow lined legal-size paper that he used during a 50+ year career as an attorney. And he had quite matter-of-factly gone over the details of his estate with my siblings and me, in greatest detail with my brother since he was the only one of us living in the area and would be handling financial matters for my mother. The other reason was the ease my father seemed to feel with the hospice social worker, Terry. Maybe it made a difference that it was a male social worker. Terry’s calm listening demeanor opened the space for my father to say “I’m tired. I’m ready for this to be over. If I don’t wake up tomorrow, that’s ok with me.” This was over ten years ago, yet the scene has not faded in the least for me: my father lying on the couch in the living room; Terry sitting low on the worn leather ottoman my parents bought in Morocco, pulled close to the couch so that my father didn’t have to strain to speak; my mother sitting across the room in an armchair; and me sitting at the end of the couch with my hand resting lightly on my father’s feet under a knitted afghan. I had put my hand there with the thought that no one should have to speak about facing his own death without feeling the touch of another human being. I made the trip from the west to the east coast six times during the last nine months of my father’s life. Each time I was a little afraid of how he would look as the disease progressed and his already lean frame wore down and his face became gaunt and hollowed. Yet he was always still himself, with sense of humor intact and often reassuring us that he wasn’t in pain, just more and more weak and tired. He said some things during those visits that have stuck with me over the years. How he had gotten immense pleasure from his family and his work. How his only regret in life was never learning to play a musical instrument. And a pointed caution to me, when I said something about being easily irritated by other people, to watch out for that tendency and to be more patient. During that last night, my mother and I took turns sitting on a wooden kitchen chair pulled up next to the hospital bed that had been set up for my father along a set of bay windows in the living room. Through most of the night his arms flailed, his long legs slid part way off the bed below where the railing kept him from falling out, and his breathing rattled with low-pitched moans. At some point my mother went upstairs to get some sleep, and I must have fallen asleep on the couch. I woke very early to the sound of my mother making coffee in the kitchen and saw that my father had quieted and was breathing more peacefully but with long stretches of silence between each breath. After calling my mother to come in, I sat in the chair next to his bed, put my hand on his, and told him it was ok to go. As he breathed a last deep breath, it seemed that something of his essence – spirit if you so believe – curled up from his chest into the morning light just coming up in the bay windows.